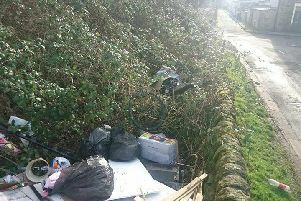 Startling figures revealed this week show that Pendle is one of the fly-tipping hotspots in the country. In fact only London, Manchester and Liverpool rate higher in the country. The figures show that in the 12 months to March last year, Pendle Council had to deal with more than 5,700 incidents of fly-tipping. And those incidents cost the council over £330,000 to clean up. Commenting on the figures, the leader of Pendle Council Coun. Mohammed Iqbal said: “In Pendle we take environmental crime extremely seriously. “We take a tough line on fly-tipping and fine and prosecute people who spoil our area. In September the council’s hard-working Environmental Crime team was featured on BBC TV’s Dom on the Spot, showing the efforts they go to in order to find the culprits. David Alexander Pendle Council’s Senior Environmental Crime Officer said: “We also take a very active role in urging people report any incidents to us on our website www.pendle.gov.uk/envirocrime or by calling 01282 661743. “Unlike many councils, we counts bin bags put out before collection day as fly tipping,” he explained. Pendle Council works hard to avoid fly-tipping and collects bulky household items, such as large pieces of furniture, cookers or fridge/freezers. It also provides an affordable collection service for DIY items including rubble and old bathroom suites with more details on www.pendle/gov.uk/recyclingandrefuse or ring 01282 661743. “We promote Lancashire County Council’s two household recycling centres in Barnoldswick and Burnley so there really is no reason to fly-tip,” added David. Pendle Council has been reminding people who are doing DIY or getting jobs done at home that they have a legal duty of care to make sure that none of their DIY waste runs the risk of being fly-tipped. David warned: “When a plumber or builder or man with a van offers to take your old bathroom suite or kitchen units away for a small charge, they may be dumping your waste illegally. • Make a note of their vehicle registration number.